How to import Sony F5/F55 XAVC video into FCP X on Mac OS X 10.7 Lion,OS X 10.8 Mountain Lion,OS X 10.9 Mavericks or OS X 10.10 Yosemite? XAVC to FCP X Converter can help you convert XAVC to ProRes video for FCP X easily. Please follow below content to get detail. The F5 and F55 both give shooters plenty of options in resolution and formats, capturing HD, 2K, QFHD (3840×2160) and true 4K (4096×2160). They’re also the first cameras to employ Sony’s new XAVC format, a cost-effective and file-size-efficient H.264/MPEG-4 Level 5.2 AVC codec that’s scalable and can support smaller 4K data files up to 60 fps, plus 8-bit, 10-bit and 12-bit color depth. Well, the software that support XAVC files are few as well, such as FCP X. FCPX 10.1 with Mavericks,Yosemite is a game changer for 4K in general, Sony’s XAVC did not work with FCPX 10.0.9 and Mountain Lion. To solve the problem, it will be better to transcode Sony PMW-F5/PMW-F55 XAVC to a more “edit” friendly codec. To achieve the goal, UFUWare HD Converter for Mac is highly recommended here. The program is an easy-to-use yet professional Sony XAVC Converter for Mac. It’s able to convert XAVC files from Sony F5/F55 to Mac fully compatible format and keep original quality at the mean while. This software can export ProRes for Final Cut Pro, Apple InterMedaite Codec(AIC) for iMovie/FCE, DNxHD for Avid Media Composer, MPEG-2 for Adobe Premiere Pro and more NLE systems for native editing. If meet the XAVC codec issues on Windows PC, please get UFUWare HD Video Converter to solve the problem. Download the software and follow the guide to convert and edit Sony F5/F55 files on Mac FCP. 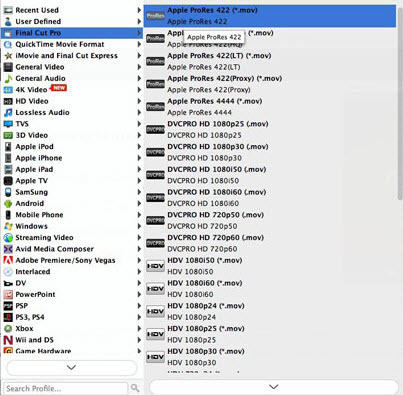 You can directly drag and drop the XAVC files to the software, or click “Add” or “Add From Folder” to locate the XAVC clips into the XAVC to FCP Mac converter. Tip: Adjust the video and audio parameters, including the Bitrate of Video&Audio, Video Size, Sample Rate, Frame Rate, Audio Channels, etc., by clicking the Settings button on the main interface for getting the best quality. If you want to convert 4K XAVC to 4K ProRes, just keep the original video size and bitrate. Tap “Convert” button on the main interface to start XAVC to ProRes conversion with the best XAVC to ProRes 422 Converter on Mac OS X. After the conversion, it is easy to import XAVC videos to Final Cut Pro 6/7/X for further editing.